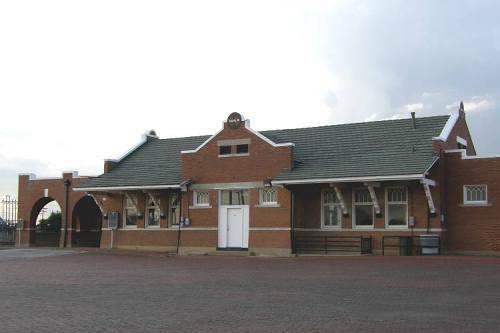 Santa Fe depot and Santa Fe Railroad in Plainview, Texas. 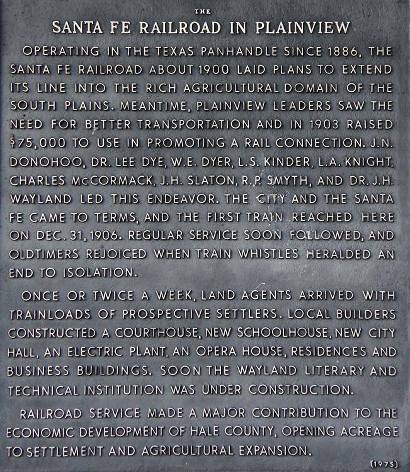 Operating in the Texas Panhandle since 1886, the Santa Fe Railroad about 1900 laid plans to extend its line into the rich agricultural domain of the South Plains. Meantime, Plainview leaders saw the need for better transportation and in 1903 raised $75,000 to use in promoting a rail connection. J.N. Donohoo, Dr. Lee Dye, W.E. Dyer, L.S. Kinder, L.A. Knight, Charles McCormack, J.H. Slaton, R.P. Smyth, and Dr. J.H. Wayland led this endeavor. The city and the Santa Fe came to terms, and the first train reached here on Dec. 31, 1906. Regular service soon followed, and oldtimers rejoiced when train whistles heralded and end to isolation. Once or twice a week, land agents arrived with trainloads of prospective settlers. Local builders constructed a courthouse, new schoolhouse, new city hall, an electric plant, an opera house, residences and business buildings. Soon the Wayland Literary and Technical Institution was under construction. Railroad service made a major contribution to the economic development of Hale County, opening acreage to settlement and agricultural expansion. The City of Plainview, founded in the 1880s, sought agricultural supremacy for its trade area. Civic leaders pioneered irrigated farming in 1911 by boring the first of many deep water wells. 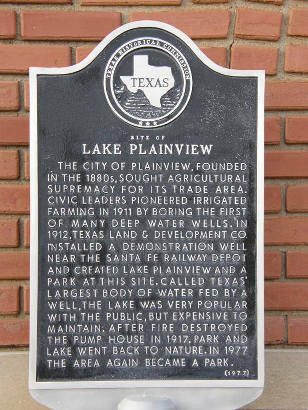 In 1912, Texas Land & Development Co. installed a demonstration well near the Santa Fe Railway Depot and created Lake Plainview and a park at this site. Called Texas' largest body of water fed by a well, the lake was very popular with the public, but expensive to maintain. After fire destroyed the pump house in 1917, park and lake went back to nature. In 1977 the area again became a park.